There’s only one day to go before the crucial vote in the House of Commons. UK PRIME MINISTER Theresa May will today repeat weekend warnings to MPs poised to reject her EU divorce deal that failing to deliver Brexit would be “catastrophic” for British democracy. On the eve of tomorrow’s monumental vote in parliament on her withdrawal agreement – forged from 18 months of gruelling negotiations with European leaders – May is set to address factory workers in Stoke, a Brexit-backing city in central England. The embattled leader, who is widely expected to lose the House of Commons vote by a wide margin, will make a final bid for support by arguing: “We all have a duty to implement the result of the referendum. “I ask MPs to consider the consequences of their actions on the faith of the British people in our democracy,” May is expected to say, according to excerpts of her speech released by her office. Britain is set to leave the European Union on 29 March but, with less than 11 weeks left, has yet to finalise the terms of its departure. May’s deal agrees a 21-month transition period under current terms while the future relationship with the bloc is negotiated, but it has drawn steadfast opposition from both Brexiteers and Remainers. The prime minister has said rejecting it will throw Britain into “uncharted territory” and put the country at risk of crashing out without an agreement, or even no Brexit at all. The Observer newspaper reported yesterday that its lawmakers have been told it could be tabled “within hours” of that tomorrow, with the confidence vote to be held the following day. If the government lose a no-confidence motion, there will be a period of 14 days in which parties can seek to find an alternative working majority in parliament. “We will table a motion of no confidence in the government at a time of our choosing, but it’s going to be soon, don’t worry about it,” Labour leader Jeremy Corbyn told the BBC yesterday. Corbyn conceded if the party won power, parliament would likely need to delay Brexit beyond 29 March so it could renegotiate the withdrawal agreement. The prime minister already postponed a House of Commons vote on her plan in December to avoid defeat – and MPs look set to reject it again tomorrow. Lawmakers who believe it either leaves Britain too close or too distant from the bloc, fired ominous warning shots this week, voting to force the prime minister to quickly set out an alternative plan for Brexit if she loses the vote. 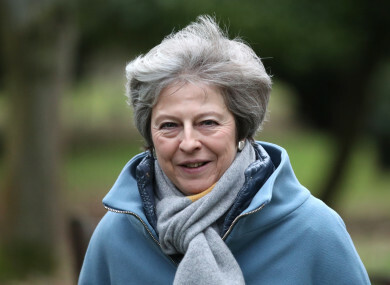 It was her second setback in 24 hours after MPs also voted to deny the government certain taxation powers in a no-deal scenario – in a bid to avoid such an outcome. Described as “a very British coup”, the plan would see May lose control of parliamentary business to MPs, threatening her ability to govern, the newspaper said. It said Downing Street was “extremely concerned” about the possibility, which could see lawmakers then delay Brexit through new legislation. Conservative MP Nick Boles, who favours a Norway-style relationship which would keep Britain in the EU’s single market, told the paper he was exploring tactics in the Commons to rule out a no-deal scenario. “We have a mechanism which will give parliament control of the Brexit negotiations and ensure we do not leave the EU without a deal on 29 March,” he said. “I am working on ways to achieve that outcome,” Boles said, indicating he would publish the plan tomorrow. Email “Theresa May to warn of 'catastrophic' effects of failing to deliver Brexit during Stoke factory visit”. Feedback on “Theresa May to warn of 'catastrophic' effects of failing to deliver Brexit during Stoke factory visit”.